Coral reefs represent one of earths most diverse ecosystems, yet it is this very ecosystem that is in the most peril. Over 30 percent of the species in coral reefs are threatened in 2016. One of the key threats is climate-induced coral bleaching and subsequent coral disease and mortality. Wave driven ocean pumps can be deployed in a linear array upstream from the target area to upwell cooler water into the mixed layer and reduce peak temperatures of surface waters. 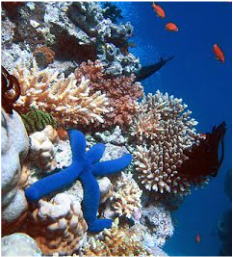 This cooler water advects onto the reef, protecting the reef from the highest temperatures that cause coral bleaching and subsequent mortality. By deploying these pumps during the peak season each year, it is possible to locally manage this effect of climate change on high-value reefs, thereby preserving these reefs during the coming decades, times that will pose the greatest threat to these ecosystems. Making these critical tools available to coral reef management authorities may determine the survival of these coral reef ecosystems in the years and decades to come, critical decades during which the reefs will be most at risk until mankind's greenhouse gas emissions come under control. Once these benefits have been demonstrated through rigorous field testing procedures, we can scale these coral reef protection systems to cover extended reef areas spanning hundreds of kilometers, thereby protecting our reef ecosystems for decades to come and preserving these jewels of the earth for future generations. Wave pump technology uses kinetic wave energy to bring up higher-nutrient deep water. In the presence of sunlight, and assuming appropriate ocean environmental conditions, the enhanced nutrients generate blooms of phytoplankton, which absorb dissolved CO2 and generate oxygen through the process of photosynthesis. When the phytoplankton are consumed by higher trophic levels such as zoopling cycles such as El Nino, etc.). This "biological pump" is the principle physical process responsible for the higher concentrations of nutrients, and CO2, which are found beneath the upper sunlit zone (typically 50 to 80 meters) of the ocean. Within the upper ocean's sunlit zone, however, the nutrients are quickly consumed, with the result that phytoplankton blooms diminish until upwelling brings up more nutrients.ankton and fish, or when the hytoplankton die, some of the absorbed CO2 as well as other biochemical contents sink. Some of this is remineralized and suspended in mid ocean depths, some sinks to the ocean floor, and some is sent back up to the surface by natural upwelling events (currents, storm-generated upwelling, heating/cooling) Until recently, conventional wisdom regarding limits to phytoplankton productivity in the upper sunlit zone of the ocean cited the Redfield Ratio as the limiting factor to how much net benefit could accrue. The Redfield Ratio limits the amount of carbon that each phosphate atom can recycle. For the average of all the ocean is it 106 carbon atoms for every phosphate atom. If CO2 recycling efficiency is limited by phosphate, and deeper water contained proportional concentrations of nitrate, phosphate and dissolved CO2, then net additional absorption from upwelling of phosphate would be balanced by the higher concentrations of CO2 brought upward - at best a zero sum game.rom wave-driven ocean pumps. But Professors David M. Karl from University of Hawaii, and Ricardo Letelier from Oregon State University have recently published a peer-reviewed paper hypothesizing that upwelling of certain deeper waters (generally 300m or more) can result in a secondary bloom governed by nitrate as the limiting nutrient - with the result that several-fold greater net absorption of CO2 is possible. The absence of nitrate causes diazotrophic (nitrogen fixing) phytoplankton to dominate the second bloom, with super-Redfield C:P ratios of >200:1. Given this new Karl-Letelier hypothesis about potential net sequestration of CO2, if ocean biogeochemical conditions are suitable for generating primary and secondary blooms, and given the potential for a single pump to produce nominal upwelling volume of 200,000 cubic meters per day (consistent with 3 meter wave height), initially we estimate upwelling of these waters could result in net additional sequestration of about 60 tons CO2 per pump per year, with the significant added benefit of 1.5 tons annual increase in fish biomass. Many elements of this process remain to be tested, including the multiple effects over many seasons and in different ocean environments, and how the upper, mid, and deep-ocean concentrations of nutrients and CO2 could transition over longer time periods. To initiate testing of the Karl-Letelier Hypothesis, in May 2008 The Climate Foundation and participated in an ocean test of three pumps in the Pacific about 60nm north of Hawaii. This test is featured on the Discovery Channel Project Earth episode "Hungry Oceans". In brief, while not all the experimental goals were achieved (due to structural failures, and an inappropriate pump deployment method), the tests conclusively proved our capability to pump up nutrient-rich water from 300m deep in the open ocean, solely using wave energy. Since we learn more from failure than success, these tests prompted a new durable pump design for extreme ocean conditions. We expect this new design, which very closely mimics natural ocean mixing processes, can be produced and deployed at equal or lower cost than our "original" design. If comprehensive future testing demonstrates that the environmental consequences are manageable and achieves permanent, additional, net CO2 absorption in the oceans, this could lead to large-scale commercial implementation. Deploy pumps in the path of the hurricane. The area of pumps begins offshore where at least 10 degrees C. colder water is found (typically a minimum depth of 75-100 meters). Since the hurricane generates ever-increasing waves, more cold water is pumped as the storm approaches, resulting in overall cooling by about one degree C. - enough to lower peak winds 5% to 20%. Since hurricane damages are proportional to the cube of windspeed, damages could be reduced up to 50 percent. Both in 2005 and 2015, a portion of the Gulf Stream spun off and formed a large eddy of very warm, deep water in the Gulf of Mexico. If an approaching storm has a well-formed eye, low wind shear in the upper atmosphere, and crosses this warm eddy, rapid intensification is likely. Therefore, a further strategy is to deploy pumps weeks ahead of time in the warm eddy to reduce its heat content and mitigate against rapid intensification. We hope to conduct further modelling of this strategy in the near future. Unsustainable over-fishing of the high seas is stressing our supply of protein from the ocean, and environmental degradation on continental shelves is further damaging the ocean environment (evident from the widening dead zones where oxygen depletion greatly curtails marine life). All this, even as our global population is expected to increase from six billion to nine billion by mid-century, requiring major expansion of global food supply. Farm-raised fish (aquaculture) is needed to satisfy the growing demand for protein from the sea, but traditional aquaculture relies on fishmeal and fish oil from the ocean "reduction" fisheries - the supply of which also is flat or declining. Grain-based food supply for aquaculture is a poor substitute as it is low in healthy omega-3 fatty acids, and shifting to grain-based food for aquaculture just adds stress and increases prices of our global food supply. Our strategy to reverse these trends is to deploy large numbers of free-drifting pumps in the open oceans, upwelling nutrients to enhance phytoplankton which forms the base of the ocean food chain. Over time, more and larger fish should grow, creating hundreds of tons of fish per year. This should support increased wild-caught fish, both for consumer markets and for the aquaculture reduction fisheries.